The text calls for a 30-day truce in order to deliver humanitarian aid and evacuate wounded from eastern Ghouta, a rebel enclave under government siege. In five days of attacks at least 400 people have been killed. People have also died in Damascus. Moscow threatens to use its veto if the resolution is unfavourable to its Syrian ally. Damascus (AsiaNews/Agencies) – The United Nations Security Council is meeting today (at 11 am local time) to vote on a draft resolution demanding a 30-day truce in Syria to allow humanitarian aid deliveries and medical evacuations. It is unclear whether the text is backed by Russia, which along with Iran is the Syrian regime’s main ally. Russia's UN ambassador called for "feasible" not "populist" action. The vote comes as warplanes pounded eastern Ghouta for a fifth day running. The UN has described what is happening in the city as "hell on earth" with hundreds of dead and wounded. Russia yesterday proposed amendments to the resolution drafted by Sweden and Kuwait, arguing that the language was unrealistic and that the 15-member Security Council could not simply impose a truce on Syria without consulting the parties. It was not immediately clear what changes were made to the text. A resolution needs nine votes in favour and no vetoes by Russia, China, the United States, Great Britain or France. Russia has cast 11 vetoes on possible Security Council action on Syria since its civil war began in March 2011. For their part, people in eastern Ghouta continue to die. According to the latest information provided by sources close to the rebels, 400 people were killed in in five days. 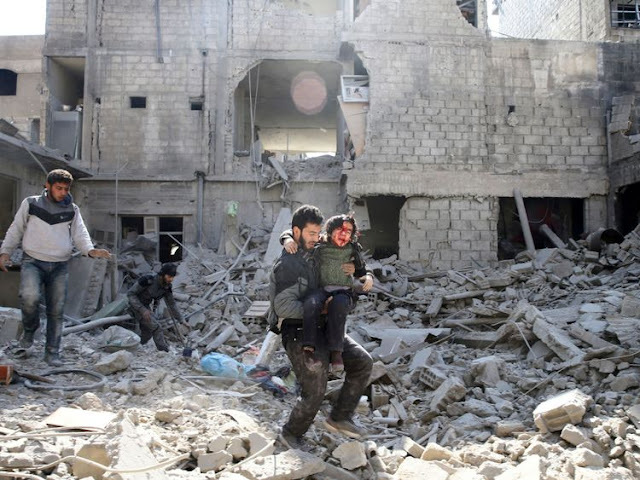 The Syrian state news agency also reported that rebel shellfire killed a child and wounded six civilians in the government-controlled Barzeh district of Damascus.